We have worked with many successful companies whose relationship with Simple Performance Marketing has greatly increased their new customers and overall revenue. AdWords is Google's own advertising platform, selling space within relevant search results to clients who can't nab a high-ranking search result organically. 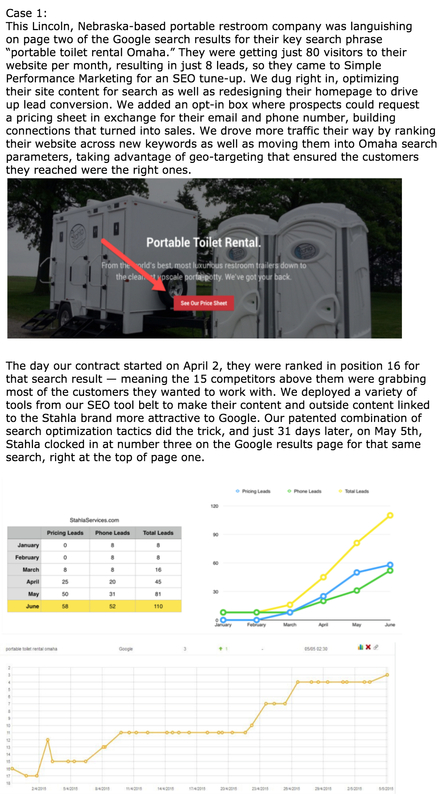 Businesses pay to buy space on the periphery of any search term's results page, assuring their brand and message will land in the sightline of potential customers when they go searching for a service or product. A well-placed, well-targeted ad constructed using AdWords can be worth its weight in gold, ensuring that each dime you spend on advertising is a direct investment in the profits it will generate. We work with Google AdWords and our own in-house SEO expertise to make sure your ad content is bright, engaging and optimized, and to guarantee it lands in front of your ideal audience at their most convertible moment. We are a Google AdWords certified partner, managing the portfolios of more than 20 clients with a monthly ad spend in excess of $30,000, all specifically targeted to bring our clients the best, most precise results and achieve their growth goals. It's the difference between buying a billboard on the side of the highway, and standing next to a customer the minute they realize they need your help. 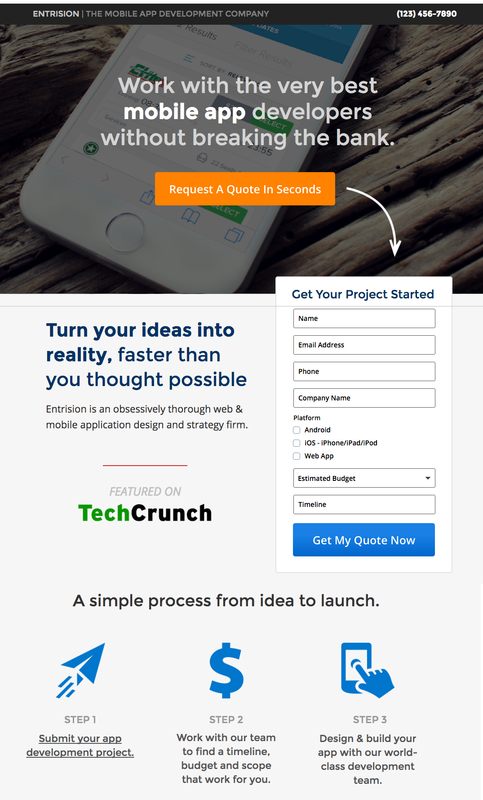 Entrision, a high-end web and software development company, was getting zero online leads per month — despite spending more than $2,000 per month on their AdWords outreach campaign — when they came to us for help revitalizing their Google advertising strategy. So we rolled up our sleeves and dug deep into their existing approach to find the pain points and places where we could refine their tactics. By tightening their language, narrowing their scope, defining their ideal clients and then chasing them aggressively, we managed to bring them over $72,000 worth of new, closed business. For those of you keeping track at home, that’s a 600% return on their investment. Talk about bang for your buck. A recent survey found that one out of every five people on earth has an active Facebook page. If you’re wondering where your potential future customers are, we’ve found them. In addition to being the biggest social platform in the universe, Facebook is also the smartest. It has a wealth of personal data available on each of its billions of users, and it analyzes that user data to build impeccably fine-tuned audiences that, in turn, it sells to advertisers. Any time you like, discuss or interact with a brand, a service or a product, Facebook takes note — and it passes those insights on to its clients. We start with an analysis of your target audience that includes identifying your ideal client and what qualities and characteristics make them convertible. What do they all have in common? What piques their interest, and what would drive them to click? We then customize our Facebook ads and target them to appear exactly when and where those users check in. We recently had the privilege of working with two high-profile real estate industry companies that were looking to target potential home-buyers with a Facebook ad strategy. Both had tried to devise and implement their own strategies independently, and neither was seeing the returns they wanted. So the SPM team got to work: first, by building a profile of potential home-buyers in each company’s target spend range, then by digging into the numbers to find out what interests they share and where and how they spend their time on Facebook. We know what actions are the most vital to our clients: click-throughs on our ads, visits to their websites, and leads that can turn into sales. And we know what brings them the most value: keeping the cost-per-click expenditures as low as we can to save our clients money, without hurting their bottom line or reducing their interactivity with customers. 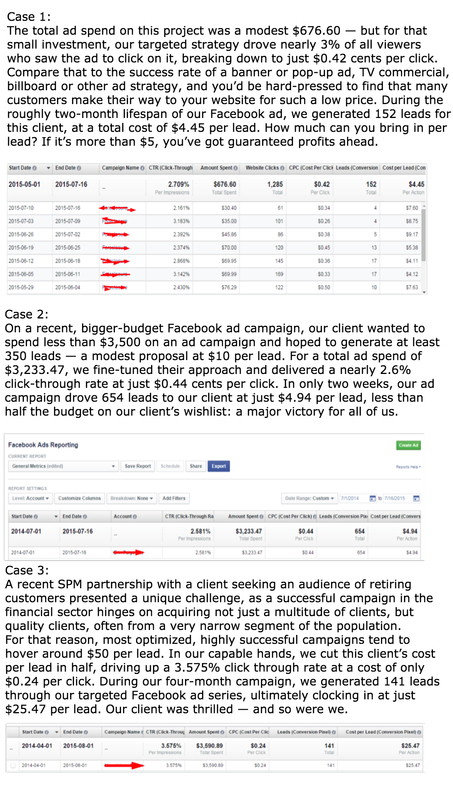 These two client partnerships generated two success stories at two very different price points, each a great example of the value of an investment in a targeted Facebook ad strategy, no matter the size of your budget. When a web user opens up Google and types in a search phrase for something they’re looking for, they’re transmitting vital information that can be invaluable insight for your business. They’re telling you they’re a potential client: you now know what they want, and how, where and when they want to buy it. Search engine users are the most convertible kind of lead because they’re actively searching for their needs to be met. That’s why it’s so important that when they hit “enter” and are shown a list of results, your website is easy for them to find. Search engine sites carefully guard the algorithms they use to determine who shows up where in search rankings, in part because where a business ends up on their results page can be so vital to that brand’s success. SEO, or Search Engine Optimization, is the process by which we carefully optimize a client’s content to game that system and drive them higher up on the list. We deploy a network of tactics to optimize our clients’ web presence in every possible way, all with the end goal of landing their content on the crucially important first page of Google results. (Think about it: when was the last time you clicked through to page 2, 3 or 4 while navigating the results page of a Google search? Exactly.) By embedding a carefully curated selection of keywords throughout our clients’ sites, adding interactive components to their pages that drive up user engagement, and sprinkling keywords that circle back to their brand across multiple other platforms around the web, we drive their webpage, inch by inch, closer to that Holy Grail, the top of Google’s relevant results pages.